The Board for Professional Engineers has adopted amendments to COMAR 09.23.03.09 to allow for the use of digital signatures by licensees. It is important to note that Maryland Professional Engineers may begin using digital signatures but they are not required to do so. The amendments became effective September 1, 2014. 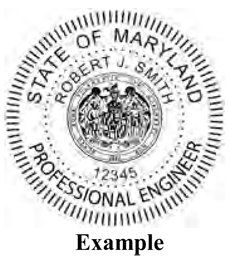 A licensee's seal shall be a seal consisting of the pictorial device of the Great Seal of Maryland as a center, surrounded by the words "State of Maryland" and "Professional Engineer" and the licensee's name and license number. An impression seal, rubber stamp facsimile, or digital seal is acceptable. "Professional Certification. I hereby certify that these documents were prepared or approved by me, and that I am a duly licensed professional engineer under the laws of the State of Maryland, License No. , Expiration Date: ." The titleblock, certification, seal, and signature shall appear close to each other.